from my constant prying camera. You'll just have to get sneakier! ;) Beautiful photos! Beautiful collection of birds and blossoms! colored. Seem to be posing in front of the camera. You take, as always, wonderful photos. really love the female cardinal pic, and I agree, even only we could keep spring in a perpetual state of becoming, birding would be easier. Mine still manage to hide, even without the foliage! Hopefully you will fool them every now and then as I hope to see many more shots of these amazing birds. You are so lucky to have such colourful subjects. So cute! I want to rub the first birds cute little head. They are such cute little buggers!! Guess you will have to lure them with more goodies!! Love your colorful captures, Reena, as always! Enjoy your day -- all of you!!! I love the beautiful winter birds we have in Pennsylvania. You do them justice with your pictures. 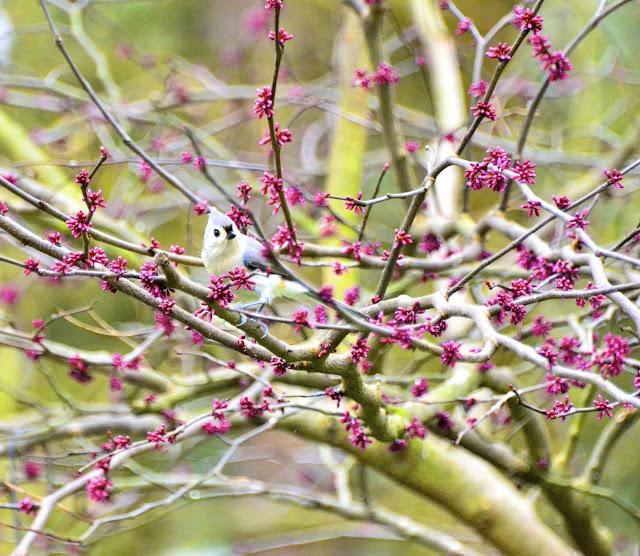 Oh, such sweet little birds - I never thought how it is easier to capture them before the trees leaf out. Two lovely mourning doves landed on my window sill the other day and peered in at me -- such a delightful surprise! I live with that frustration all the time because we have pines and redwoods. The birds are beautiful but so are the flowers. I like the little blue fellow color coordinated with the blue flowers! HE, he, he, that pesky foliage. I know exactly what you mean. 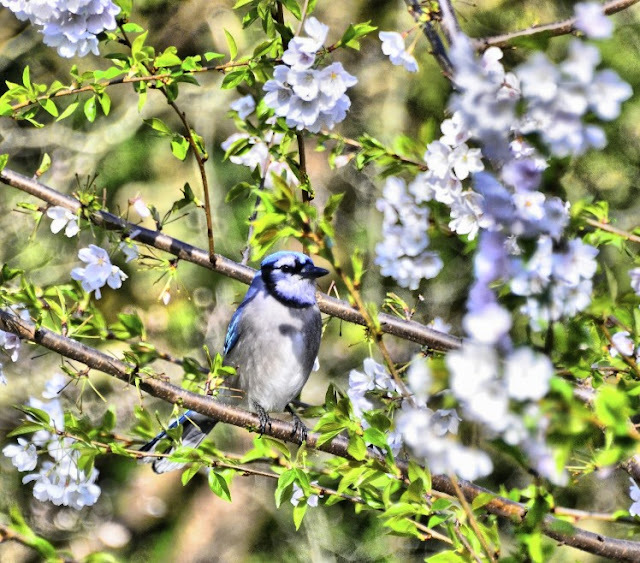 Wow, love the jay shot in the camouflaging flowers! And the cardinal looks like a very young one. You are right, when the leaves come out, it is not easy to get good shots of the birds, or even see them! You'll have to coax them out with some gourmet seed in the feeders. Can't get enough of those Cardinals. Thanks for the sensor cleaning tips. I think I'll do the same. I would love to hear how it goes for you. 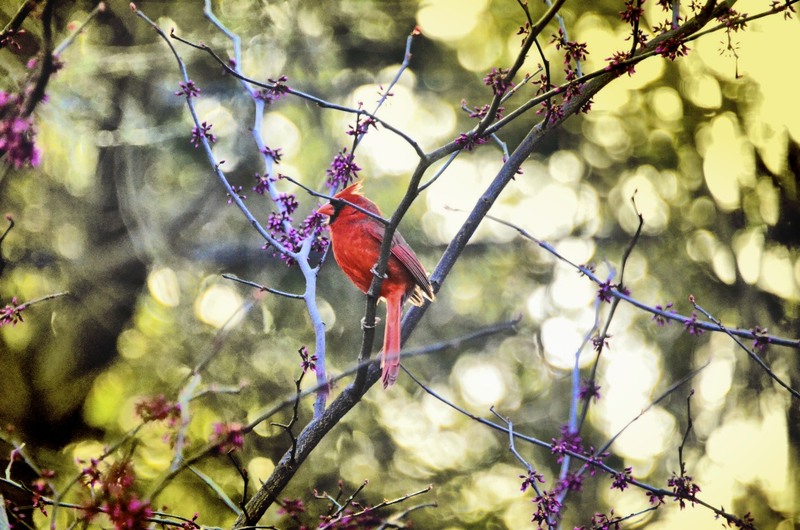 Wonderful shots of the cardinals! Become one with nature and the birds will come to you! Oh yes, I feel the same way. But then the occasionaly summer catch is a victory. Beautiful blossoms and birds. You're right! They love to hide behind the leaves. These shots are beautiful! You will just have to build yourself a tree house. After that bathroom remodel, there is nothing I won't suggest you do. oh those pesky leaves, they can be such a bother!! 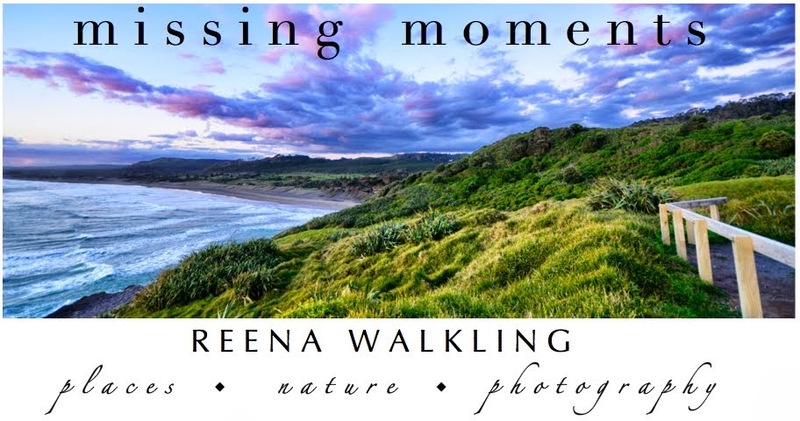 Reena, wonderful shots of the birds. Once the leaves are on the trees it will be much harder to get a decent bird photo. I think they will still show their pretty selves around your yard. Yes naked trees do make bird spotting a lot easier. That last cardinal pose is very funny. Oh, I bet if you feed them, they will come. How wonderful these are Reena, especially the first one. You have to crawl, camouflage, and hide in order to pry. These little guys are soo cute!! Love the pictures. Cools stuff, love the cardinals! Always love your bird pics, really nice. hi reena, absolutely loved seeing those beautiful birds! Ahhh.. I do love seeing your bird shots. How cool to have so many different birds. I agree. I purposely set up my feeders and bird bath near shrubs and cover. I have to keep reminding myself it is for they safety and if I want a picture I need to put up my lounge chair and a cooler of food and WAIT!! Yeah, Spring and Autumn give the best views of backyard friends. Well said Reena! And the bird photos are beautiful. 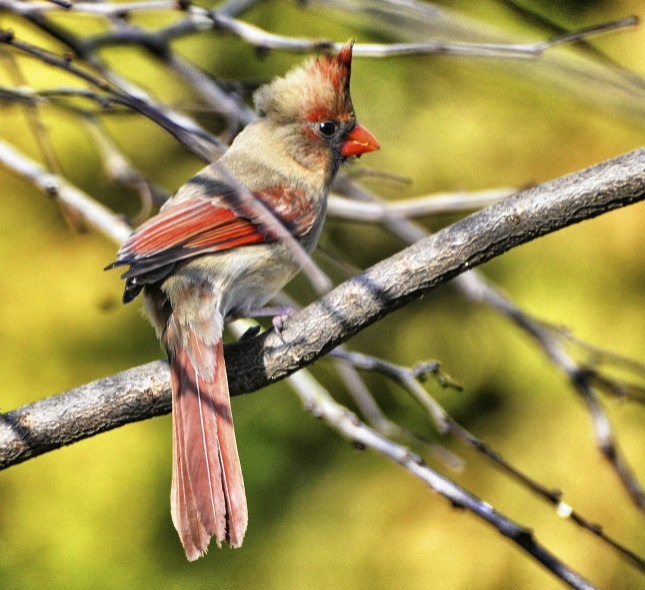 The first one of the female Northern Cardinal is absolutely fantastic! That first shot is a stunner. Something tells me that you'll still be able to capture these fantastic shots!! Such beauty. The second is really rather stunning too! 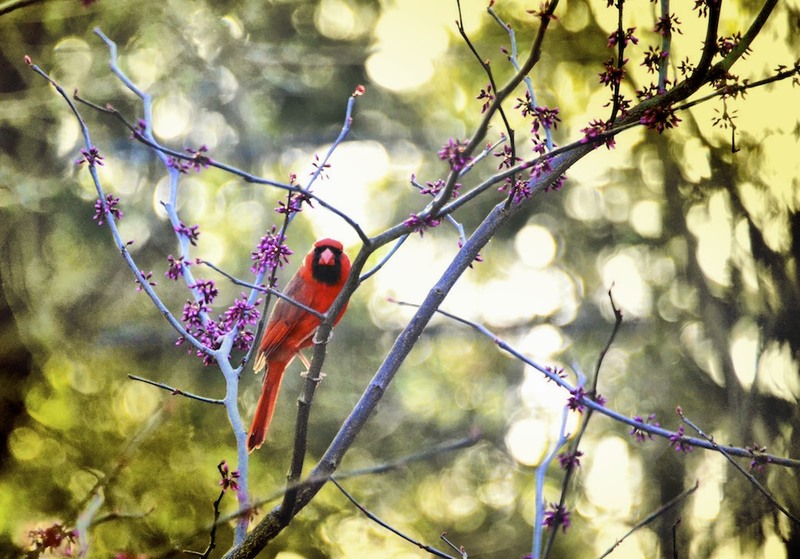 Beautiful birds and photos of them! You captured the most beautiful light along with your photography.